The earliest examples of known automatons appeared in the Islamic world in the 12th and 13th centuries. 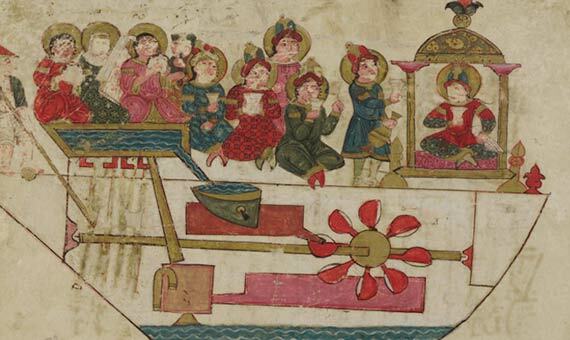 In 1206, the Arab polymath Al-Jazari, whose creations were known for their sophistication, described some of his most notable automatons: an automatic wine dispenser, a soap and towels dispenser and an orchestra-automaton that operated by the force of water. This latter invention was meant to liven up parties and banquets with music while floating on a pond, lake or fountain. As the water flowed, it started a rotating drum with pegs that, in turn, moved levers whose movement produced different sounds and movements. As the pegs responsible for the musical notes could be exchanged for different ones in order to interpret another melody, it is considered one of the first programmable machines in history. 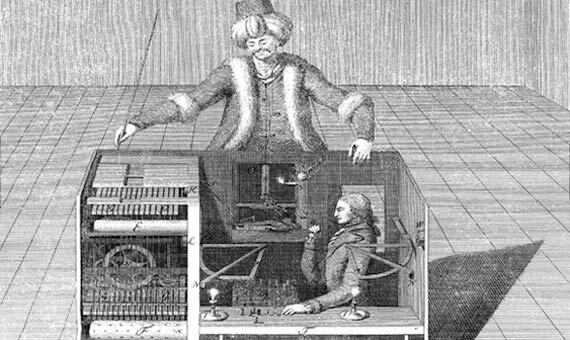 The most famous automaton in history was an “impostor.” In 1769, the Hungarian aristocrat Wolfgang von Kempelen made an imposing wooden bust of a chess player, known today as the Turk for its attire. It emerged behind a large, closed wooden table (which housed a complex system of gears, cables and pulleys) presided over by a chessboard. It soon gained fame through a tour of exhibitions in the most distinguished salons and auditoriums of Europe, in which the automaton challenged and always defeated the distinguished attendees, such as Napoleon Bonaparte. The Automaton Chess-player did not repeat a collection of movements, as automatons do, but it knew how to play, which caused admiration but also led to suspicions. In 1790, Von Kempelen suddenly dismantled his creation, which disappeared from circulation for three decades. After the death of its creator, the Turk was sold to the German student Johann Maelzel, who returned to exhibit it in Europe and America. However, with each new victory the suspicion increased. The writer Edgar Allan Poe, after attending one of his shows, stated that there had to be a real player inside the bust. Though mistaken, Poe was not far off. The trick of the automaton’s invincibility lay in the presence of a real chess master—as one of the people implicated confessed to the press in 1837—who was hidden behind the mechanism of the table thanks to an ingenious system of sliding panels. Using magnetic pieces, he could play a game upside down on the inside face of the board while his arms were connected with those of the bust by means of an articulated device. After the fraud was revealed, the Turk was definitively dismantled and relegated to a warehouse, where it was destroyed by a fire in 1854. Automatons reached their moment of greatest splendor in 18th century Europe, when the miniaturization of the devices became possible thanks to the development of clockwork mechanisms. This is why many of the most famous builders of automata were also reputed watchmakers. For instance, the Swiss master Pierre Jaques-Droz built three automata of extraordinary complexity between 1768 and 1774. They were known as the Little Writer, the Little Draughtsman and the Little Musician because they only measured about 60 centimetres. They integrated a system of “coded” discs (with punched edges) and hundreds of moving parts that allowed them to write individual letters with real ink and paper, make drawings and even play music on a real organ at their scale. In 1773, the inventor, watchmaker and instrument maker John Joseph Merlin built a life-size automaton swan. When it was put into operation, delightful music sounded and the swan moved its head to both sides, smoothed the plumage of its back and leaned over the water to catch a small fish. It was an astonishing and elaborate staging that was executed thanks to the three clockwork mechanisms of its interior that independently controlled the bed of the river, a music box and the movements of the figure. Nearly a century later, when it was exhibited at the Universal Exhibition of Paris of 1867, it continued to cause sensation. 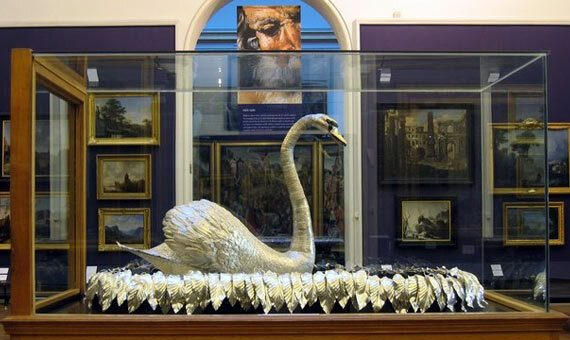 Mark Twain mentions it in his book The Innocents Abroad: “I have seen the silver swan, which had a living grace about its movement and a living intelligence in its eyes…” In Paris, the swan also captivated the millionaire Bowes couple, who acquired it in 1882 and made it the symbol of their museum, where it still operates today. On July 12, 1515, Giuliano de Medici presented to Francis I, the newly crowned King of France, an incredible mechanical lion. Before the admiration of those present, the ingenious device crossed the room to stand before the monarch and opened its chest to offer a bouquet of lilies, a way of symbolizing the close relationship between the Florentine family—whose emblem is a lion—and the French crown, identified with the fleur-de-lis. The automata lion had been built by Leonardo da Vinci, emulating another that he had already made in 1509. Around 1495, Da Vinci had already designed his first automaton, an armed mechanical knight that housed within his armor a complex mechanism of wheels and gears, cables and pulleys. It could sit down and stand up, turn its head, cross its arms and lift the visor of its helmet, according to the sketches and drawings of the notebook recovered in 1950. It is not certain that Leonardo ever came to build it, but it is known that it worked thanks to a replica that NASA constructed. Mark Rosheim, an engineer with the US space agency, replicated the automaton in 2002 on the basis of those drawings and verified the perfection of its design, to the point of implementing some of Leonardo’s ideas in his work with NASA robots. In 1738, the three most famous creations of the French inventor Jacques de Vaucanson (1709-1782) came to light, placing him as one of the greatest automaton builders of all time. Two of them, built to actual size and with the appearance of shepherds, could interpret a dozen songs with real instruments. 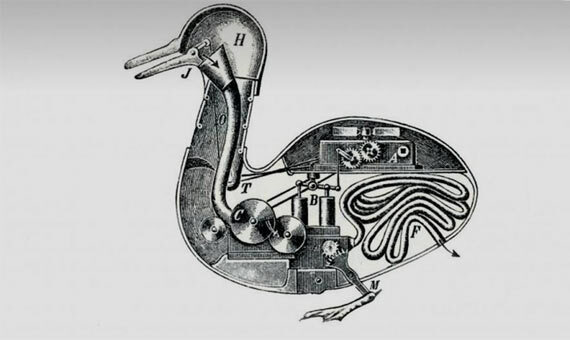 The third and most celebrated was his “Digesting Duck,” a copper duck composed of more than 400 moving parts that allowed it to quack, flap its wings, drink, eat grain, digest it and defecate, a complete digestion process that viewers could witness, with the abdomen open. Unfortunately, after their sale, the three mechanical devices disappeared or were destroyed. After that astounding debut, no other Vaucanson automaton ever appeared. It is believed that during the next forty years the inventor worked obsessively on an automaton that faithfully replicated all the processes and movements of the human body: blood circulation, respiration, digestion, muscular and nervous system, etc., a project too ambitious for the technology and materials of the time and that was never completed.